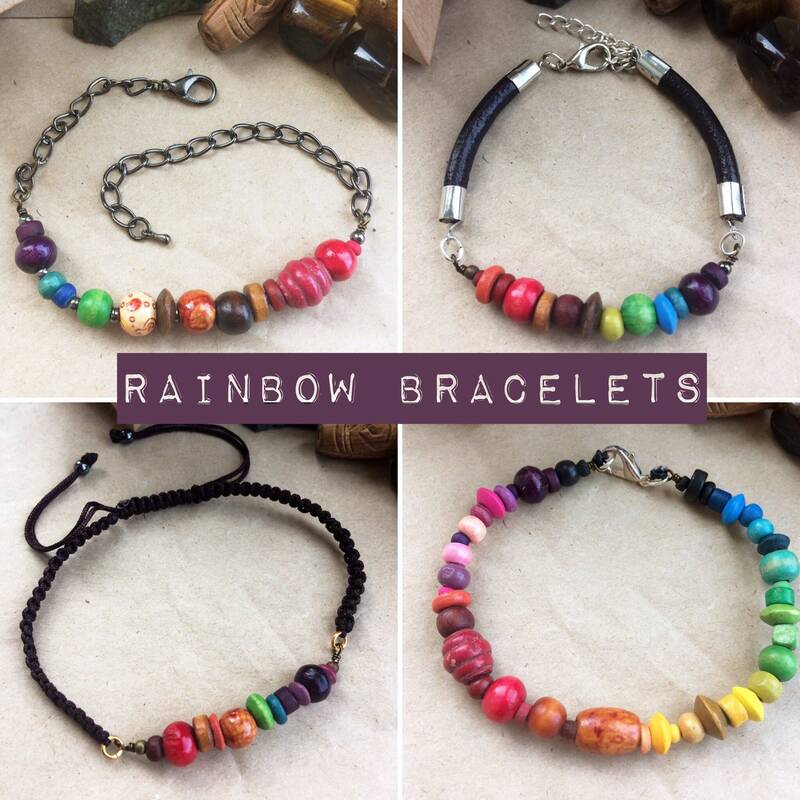 A choice of 4 bead bracelets in rainbow colours. 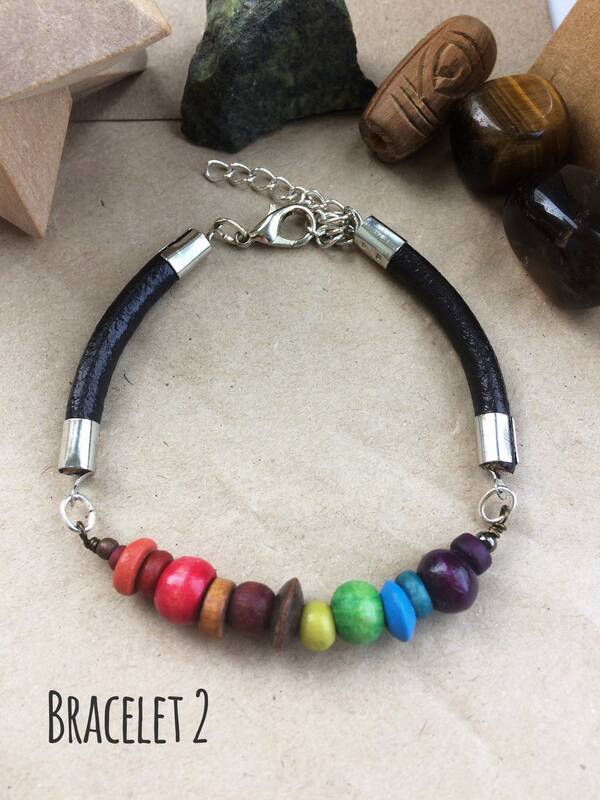 These are a unisex design for men or women, with deliberately adjustable sizing to fit all. 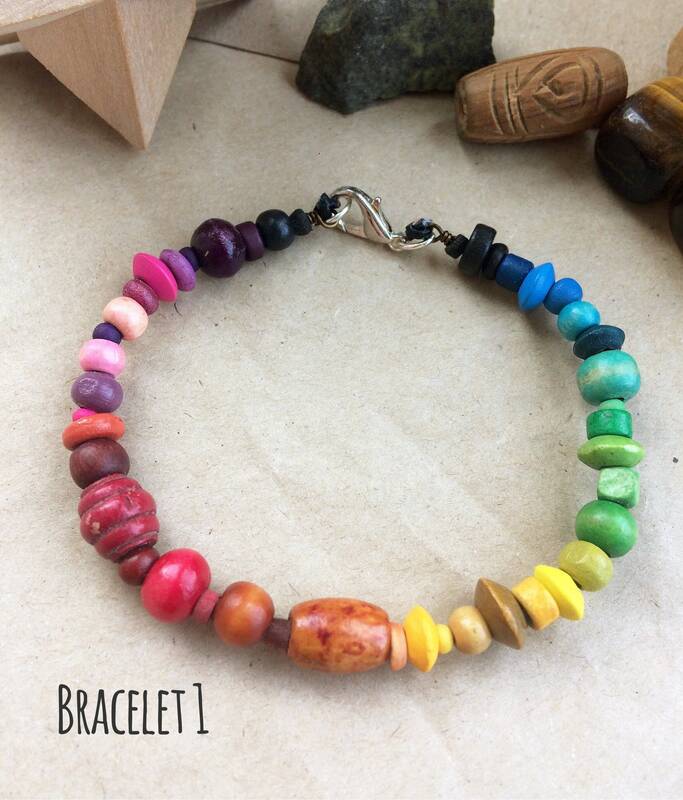 Made using vintage wood beads in a eclectic mix of size, shape and texture. Matching wood earrings are also available. They are numbered in the pictures. Discounted postage is offered automatically for multiple purchases. The bracelets make a perfect gift and are presented in a organza gift bag or lino printed packaging as shown. Gift wrapping is also available and I am happy to include custom messages. 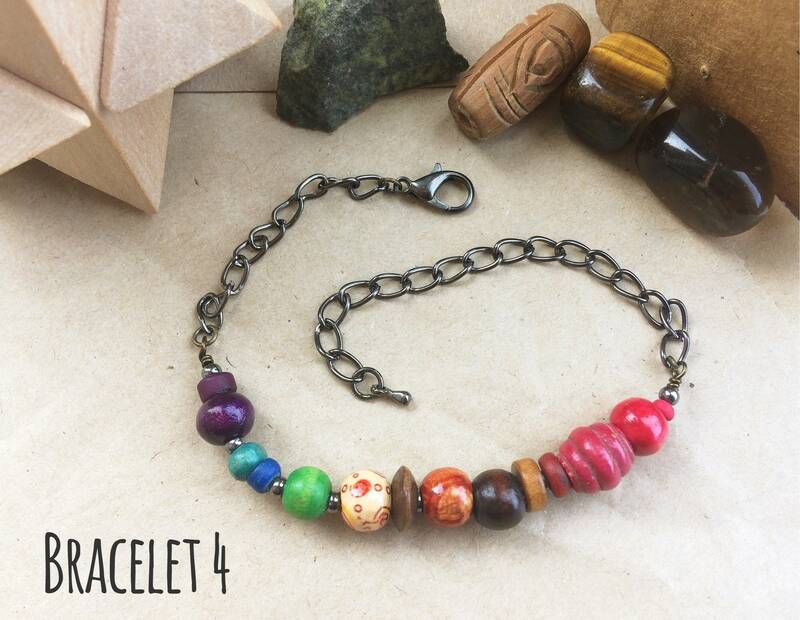 Bracelet 1: Sized 21cm\8.5" (large ladies/medium man size). Closes with stainless steel lobster clasp. 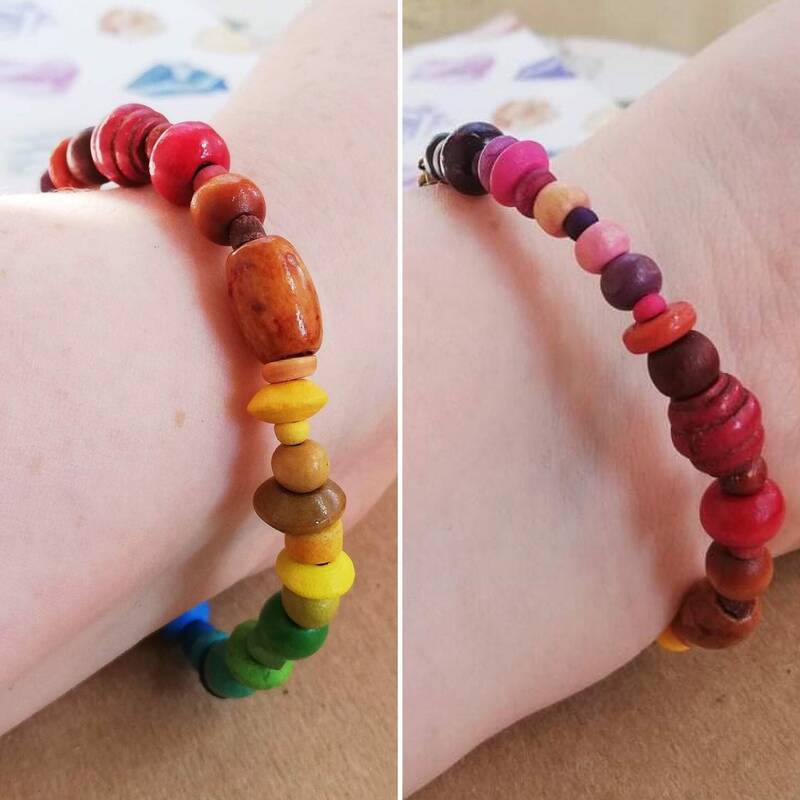 Bracelet 2: From 20cm\8" to 24-9" (adjustable to fit). With leather corn. Stainless steel lobster clasp and extender chain. 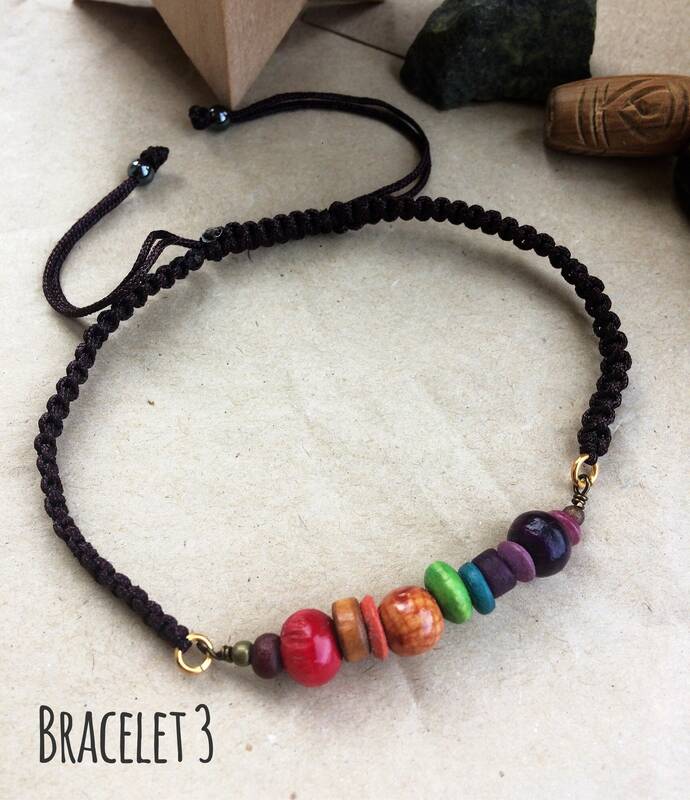 Bracelet 3: Adjustable fit from 14cm. Cord in a dark brown colour about 4~6mm wide, this is adjustable by pulling on the strings, from a average ladies size to generous man's fit. Bracelet 4: Totally adjustable from ladies small to large male size with black clasp on large link black chain. 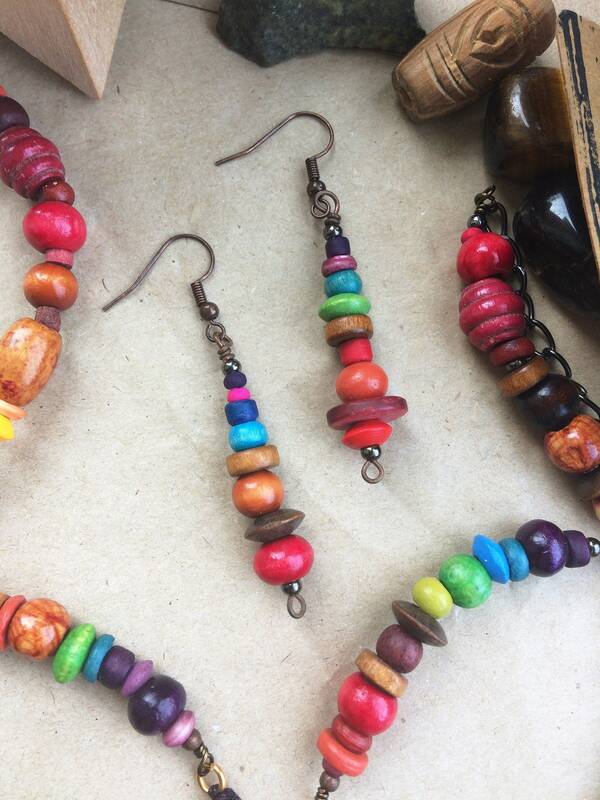 Matching Earrings: Approx 4.5cm drop with multi-coloured wood beads. Affixed to dark copper coloured ear wires. Please contact me for specific requirements like hypoallergenic or sterling metal. I am also happy (and pretty excited) to consider bespoke or matching pieces. Get in touch! A lot of the components are natural materials so they can be fragile or prone to attack by water or rough handling. To protect your jewellery please handle it carefully and remove it before bathing/showering, swimming and snoozing. It is also a good idea to avoid getting perfume, make-up or creams on jewellery. I carefully pack all items in a box or organza bag with bubble wrap for safe travel. These are then sent via Royal Mail in a padded envelope (preferably recycled envelopes where possible). Feel free to contact me should you require gift wrapping or have specific delivery requests. 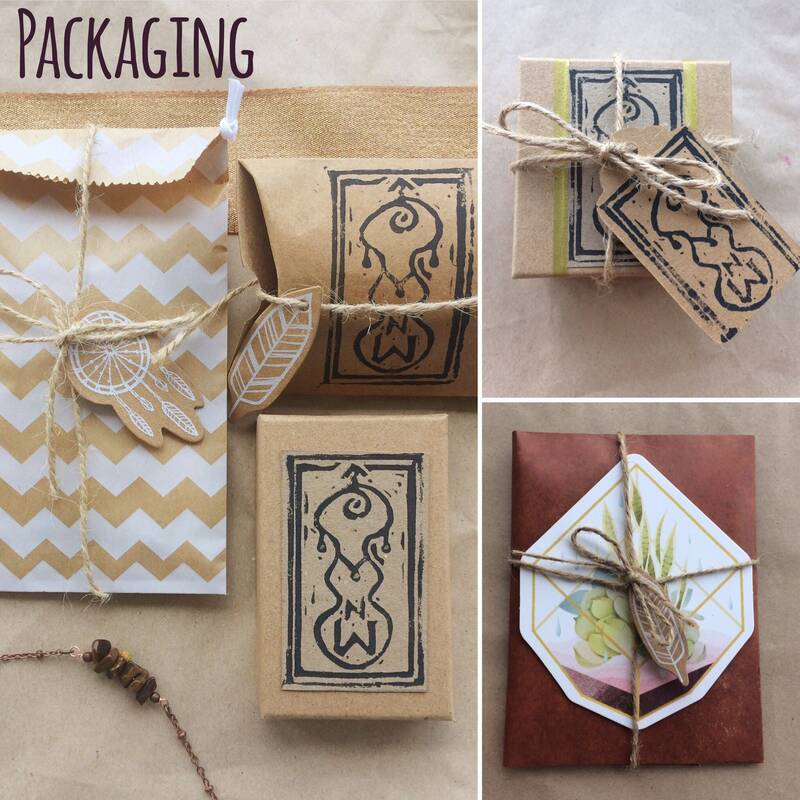 See my shop photos for examples of packaging featuring individually made NW Lino printed packaging. The shop should automatically apply a multiple purchase shipping discount. I send parcels second class as standard with proof of posting obtained, but contact me should you specifically want a insured parcel. What metal do you use? These are most often silver plated or aluminium with copper or black plating. Sterling silver, stainless steel and hypo-allergenic findings are available on request. Additionally should you prefer a different type of ear wire (e.g. French hook, kidney wire, clip-on, stud) please get in touch. Most of the wire I use is either copper, aluminium or iron and plated with copper, silver or black colour plating. The thickness I most often use is 0.4mm. For more specific information about the components in a particular item, please ask. What gemstones do you use & can you make items in specific birthstones? I love to use semi-precious gemstones like agate, quartz, lapis lazuli (and many many more). I find the reputed mystical and healing properties of these stones interesting (and know many people do) so will include a few lines about these for the appropriate items. I think there's something special about using organic materials and wearing these treasures from nature against one’s skin. I find it a joy to work with them and hope this positive energy will transfer to their new owners. See my 'birthstone jewellery' section in the shop. What are the clay/ceramic components? These are made using either stoneware fired and glazed clay (hardy but can be fragile if dropped) or air-dry clay. I really like working with the latter as there is limitless potential to create unique interesting components and finishes without needing to kiln fire. However it is a bit of a unknown quantity in that I’ve only recently started working with it and have no personal experience of how it behaves over time. The manufacturer information states this is very durable, particularly when varnished and is PVC free, containing only vegetable binders. I have varnished these with a double coating but would still recommend taking special care with these components, particularly avoiding water or intense heat/cold. What do you mean when you say 'recycled' materials? 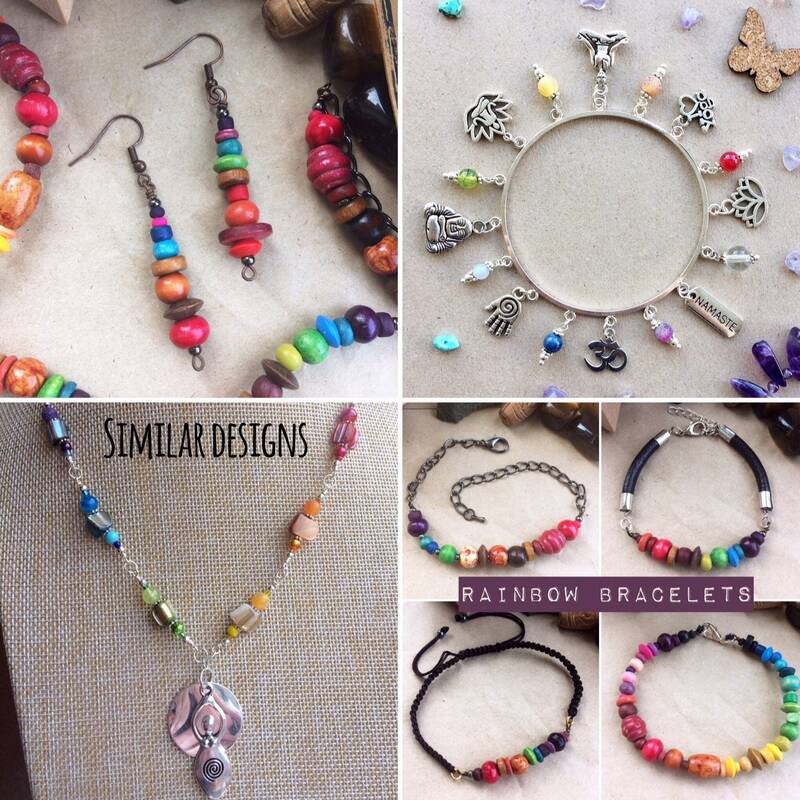 I use beads in a variety of sizes, colours, finishes and origins. I’ll be as specific as possible in the listings about materials. I do enjoy using recycled materials as much as possible mainly due the surprise of coming across unusual items of mysterious origins (!) and I’ll pick them up at places like charity shops, car boot sales etc. or even re-purpose my old jewellery. I will always replace ear wires and fastenings though for hygiene reasons. Do you post internationally and when will my item arrive? Yes I'm perfectly happy to do this and parcels are sent with Royal Mail. I will always dispatch orders within 2 working days (except custom orders which may take longer). I use Royal Mail second class in the UK and Royal Mail International Economy Delivery. Please note, these are not tracked or priority shipping services, if you require those, please contact me prior to purchase and I will provide an updated invoice.